WILLIAM SWEETLAND was born in North Bradley, Wiltshire in 1822 (although for reasons unknown, he believed he was born in 1820). At the classical school to which he was sent he was considered a dunce, probably because he was misunderstood. He was fond of sketching and heraldry. He once had his head cut open for investigating too closely the Arms upon a coach. When four and a half years of age he essayed the making of a musical instrument – a May horn. Aged six he made a dulcimer, and at nine years of age, lacking the means to buy an accordion, he made one with eight keys. Then when he was ten he made a guitar, but whilst making it he cut his wrist so badly that he retained the scar for the rest of his life. Not being satisfied with the tone of the instrument, he told his father – who, by the way, was a carpenter and builder – that he would like a violin. The father, probably with a view to incite the boy to make one for himself, said that he would never have one brought into the house. Young Sweetland brooded over this remark; and, perceiving that his father had not said he should not make one, forthwith, went to work and produced a facsimile of one he had seen. As it progressed he hid it beneath the bench. One day, his father having dropped a tool, stooped to search amongst the shavings and discovered the violin then nearly finished. The boy of course expected severe punishment; but greatly to his relief it met with his father’s approval, and he was allowed to complete it. He then learnt to play upon it, sacred music being the only kind permitted. He was 11 years of age when he made this violin. At 12 he made a ‘cello and a harp at 13. Being anxious to excel in anything he undertook, he was in the habit of rising at six and working until two in the morning; and, although his parents hid the candles, he managed to get others. When he was about 20, his parents, conceiving him to be mechanically inclined, apprenticed him to Mr. Sherbourne, an organ builder in Bath. At that time there were only eight firms of Organbuilders in London, and eight in the provinces. Under Mr. Sherbourne he gained much knowledge, as the men that gentleman employed were the best London hands to be procured. Such was the boy’s progress that in the second year of his apprenticeship he made a small organ throughout, without assistance. After his apprenticeship was completed trade was bad; no work was to be obtained as a workman, and having an offer to build an organ in Bath, and some repairs coming in, he began on his own account. The Sweetland Organ Factory was set up in 1846. 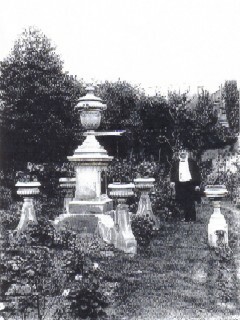 In 1849 he had given such satisfaction that he was entrusted to build an organ for St. Michael’s Church, Bath, and following that made instruments for all parts of the country. His organs were pronounced by Mr. Best, Sir Walter Parratt and Sir F. Ouseley, Doctor of Music, to be the best in England of their size; and under the last gentleman’s supervision he built a large number. 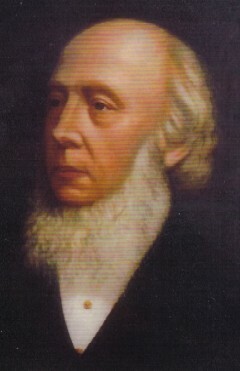 Mr. Kendrick Pyne, of Manchester Cathedral, considered Mr. Sweetland to be the finest mechanist in England. In 1874 at the age of 54, Sweetland started a further career as an artist. This came about after he was commissioned to build an organ for Edwin Long RA, of London. At the time this instrument was in course of construction, Long was painting his well-known picture ‘The Pool of Bethesda’ and on a later visit to tune the organ, seeing Long’s painting of ‘Jepthah’s Rash Vow’, Sweetland was duly inspired to paint. His first picture was of a Spanish monk, with book in hand, in the act of singing. The picture was judged to be a fine work of art and Sweetland went on to paint a number of other marvellous works, some of them copies. His most ambitious work was a painting with a subject of the Resurrection, painted at the age of 76 years. His conception of the Rising of the Dead occupied nearly the whole of a room and he was engaged on it for 12 years. It was not entirely completed but the press extracts were rapturous: “The conception of a genius”, “Sweetland’s most ambitious work”, “The most wonderful effect of realism we have ever seen and the spectacle of the opened Heaven is grand beyond conception”, “The picture in its present state is worth going a hundred miles to see; when it is finished, no pilgrimage would be too great”. In addition to many improvements connected with organ building, he invented a microphone, a stand for tympany, and several other things. His house was crammed with specimens of his work in various branches of art. Much of the ornamentation was from his own designs, and a great portion of the carvings were made by his own hand. There was a fine marquetry Loo table, made by himself, and a selection of the woods in order to obtain the effect, were made with great judgement. The ‘Gentleman’s Journal’ thought that Mr. Sweetland was a most remarkable man and considered him to be as an individual probably the greatest natural genius in Bath. 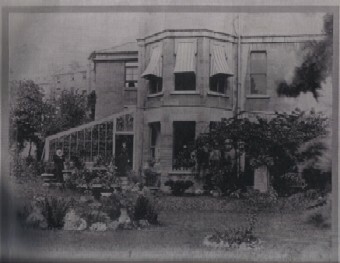 In 1902, Sweetland handed his business over to a company at the age of 82. Around this time he also supervised the building of a large funeral monument, representing his work as an artist and craftsman. He desired to be buried amid the surroundings in which he had laboured throughout a long life. 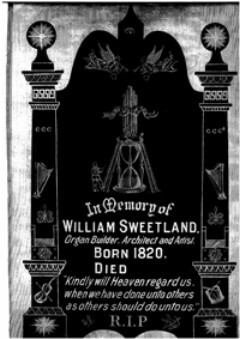 William Sweetland died on 21st October, 1910, aged 90. In his lifetime he had built some 300 instruments including, of course, our beloved organ in Gillingham Methodist Church.